So I've seen trillium (trillii?) twice this spring. Once on Mt. Tam and once in Tilden Park. They really are quite stunning. There is something about hiking along and suddenly coming across a few of them. First up one of the many I saw on Mt. Tam. Some from Tilden. 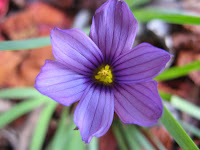 First a purple. And last a trio of trillium. So they always sell a few of these at the annual Tilden plant sale, but evidently they are sold within the first moments of opening. So if you want some and want to shell out some cash (they aren't cheap) get there early. 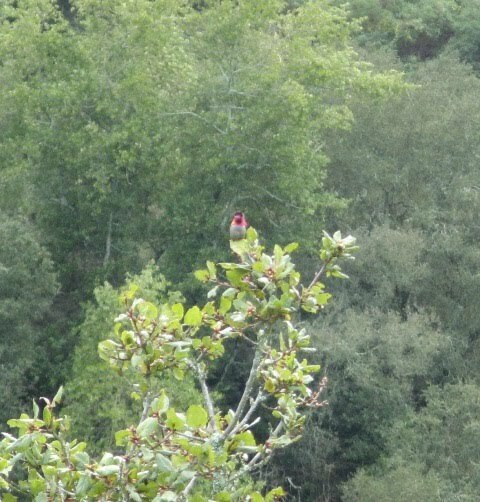 So I saw this little guy in Huckleberry Botanic Preserve about a month ago. I've been slow on the postings. 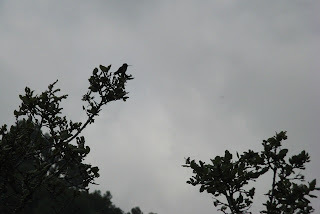 I was up in the manzanita barren when I heard the telltale chirp of the humming bird. I looked up and saw it fly straight up and then dive down to a manzanita a ways off. It kept going back and forth between a couple plants (a chinquapin and manzanita) and basically looked to be putting on a show, whether for me or something else, I'm not sure. Here he is silhouetted against the sky. Here you'll find a little description and a recording of their call. Be sure to click on the life history tab. Apparently Anna's hummingbird used to only breed in Northern Baja and Southern California, but with all of us happy gardeners doing our work, they have greatly expanded their breeding range. 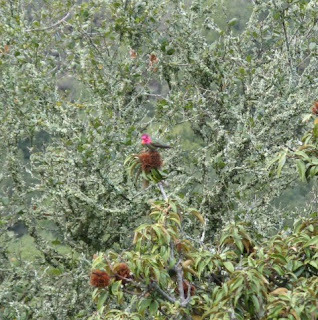 Mainly I identified it because I know this hummingbird has a bright iridescent red or pink throat and is common here in the Bay Area. And evidently it's the only one that overwinters here regularly. We have a resident one here at the house that often chirps from high above or lands on our neighbor's plum tree. I've seen him drinking nectar from arugula, columbine, fuchsia, California fuchsia, various salvia, citrus blossoms and I think the passionflower. I went hiking on Mt. Tam a couple of weeks ago because the weather was beautiful and I wanted out of the East Bay. Mt. 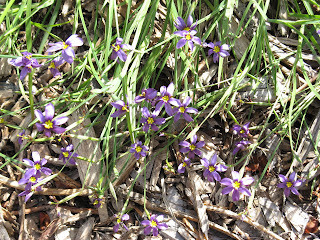 Tam has some beautiful wildflower displays in the spring, but I knew it was a little early for that. 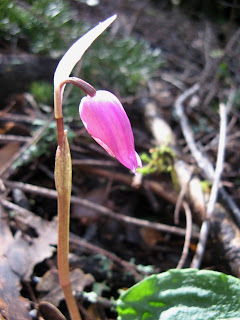 Fortunately, there were some that had already popped up including this rare beauty - Calypso bulbosa aka Fairy Slipper. One of 31 orchids native to California. Who knew? Here are two orchids just popping out of the ground. Here one is just getting ready to open. In the bottom of the photo you can see its one big, dark green leaf. It appears to be all they have. 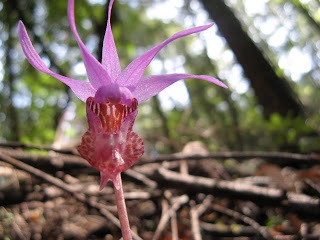 And the fairy slipper in all its beauty. I saw these the first time 2 years ago and was pleasantly surprised to learn we had orchids here in the Bay Area that weren't indoors and from far away. 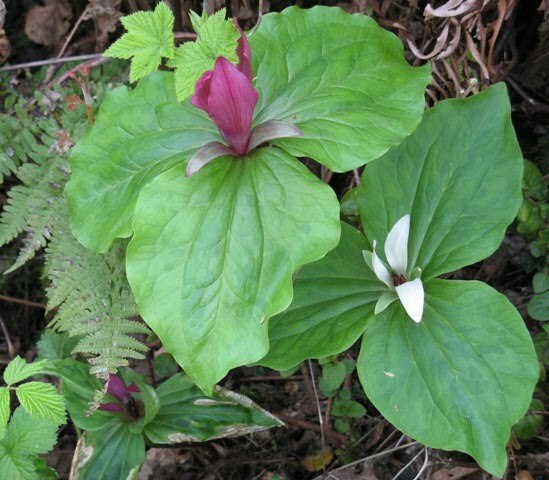 From my observation they grow in shadier parts of the forest on flat or sloped ground, though they seem to be more common in damper places. Hopefully some are still out there so you can see these for yourselves. And since nothing seems to say spring like a native forest orchid lit up by tree filtered light, I'm entering the second photo in Gardening Gone Wild's Picture This contest for this month. The theme is Awakening to show the beginning of spring. So though I'm sad about leaving this wonderful garden many plants have decided to say goodbye in a showy fashion. 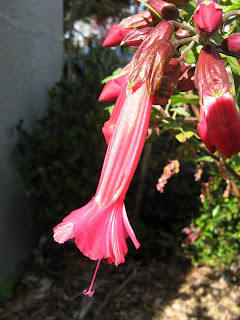 The most exciting of which is this, my sacred flower of the incas plant (Cantua buxifolia). It's been in the ground for a year and a half and just started blooming a few days ago. Only one fully opened flower so far, but I'm so excited. I didn't think I'd get to see it. 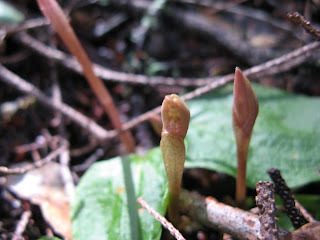 Strange how the aggressive, phallic buds, turn into a swirling, elegant, skirt-like flower. 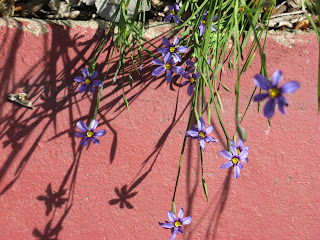 Sisyrinchium bellum, or blue-eyed grass, one of my favorite CA wildflowers. They've been blooming since January, but I haven't gotten any good pictures until now. And they have just exploded. 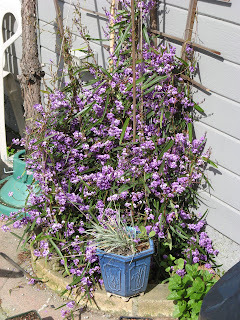 As have the hardenbergia and ceanothus. 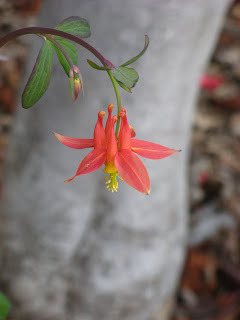 The Western Columbine (Aquilegia formosa) in front are now competing with those in back. 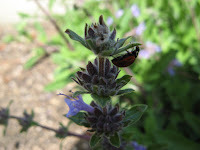 Here's my Salvia bees' bliss. This triangle of dirt is usually overflowing with wildflowers this time of year, but my housemates planted some veggies here last summer and they didn't come back. 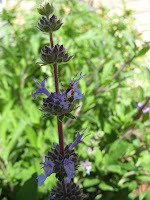 The salvia is really happy though and will take over most of the area. I couldn't get a good pic of it, but I did have fun watching this ladybug zoom around. 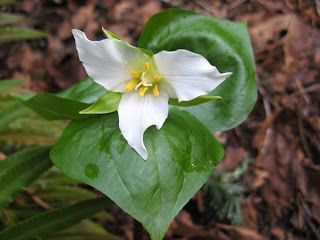 Quite a few white flowers. 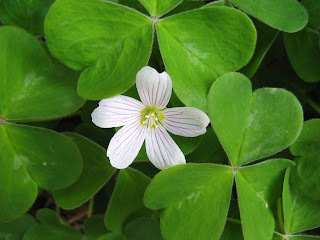 The redwood sorrel (Oxalis oregana) has some beautiful white flowers shyly poking out just in time for St. Patty's day. 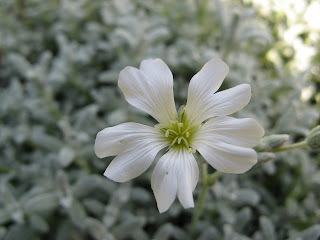 And the snow-in-summer has sent up a few flowers, as it has been doing since January. It keeps hoping for summer. 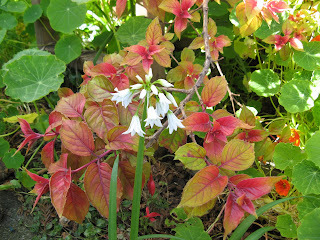 And this wild onion, has truly beautiful flowers (here contrasted against a fuchsia. But they are horribly invasive, and since I won't be here to keep them under control, I pulled this one out right after the photo. A happy bloom day to you all. 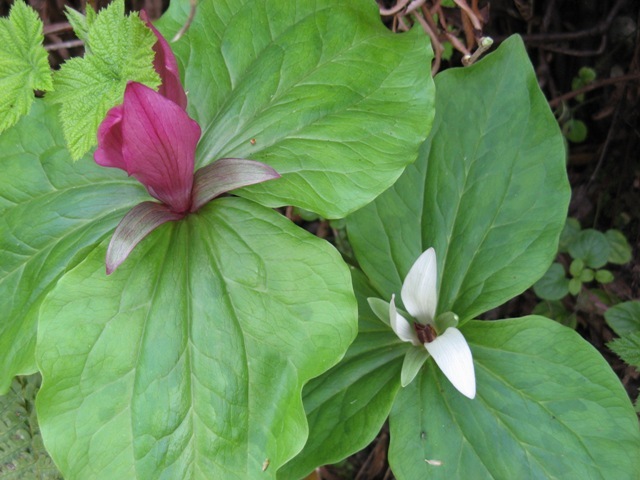 Hopefully spring is at least on its way for those of you in colder climes. And thanks to Carol over at May Dreams Gardens for hosting this show. So James at Lost in the Landscape followed by Town Mouse, and perhaps more I'm not aware of, posted about what their gardens would like after they were gone. And I've been waiting to post my own because I will be moving at the end of the month. I guess I'll see what happens at least to the front since I'm not moving that far away. But I wanted to let my landlord know and find a place before this post. And I did. My own apartment with a big ledge for some potted plants and a communal gardening space in back. So my garden will continue just in an altered form. In front, the lawn has shown no sign of returning after a few blades of grass easily pulled out right after we got rid of it. And with all our rains, very few weeds and no grass. 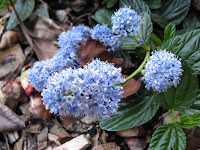 So anything like that that comes up will be seeded from the neighbors'. 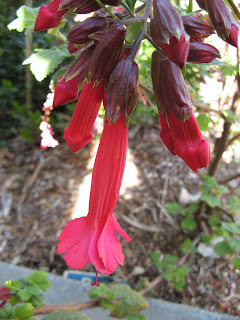 The fuchsia might become a little aggressive though. 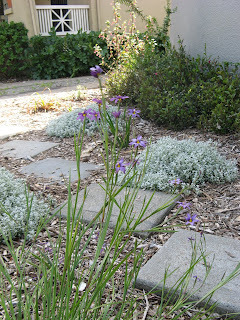 I'm afraid this path will look a little sad and dry with no summer water, but the iris and snow-in-summer will perk up with the rains. I'm more worried about 2 other sages, one of which is already not looking so hot. I'm also worried about this licorice plant (right). 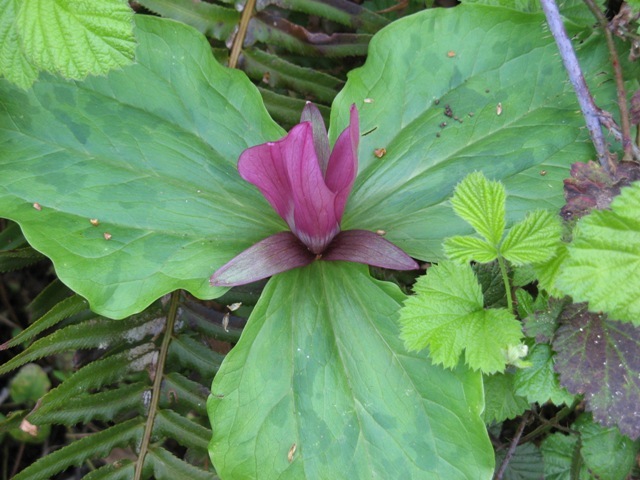 It's invasive, which I didn't know when we planted it. I kinda want to pull it, but it would leave a big empty scar. Maybe not so great for my landlord trying to re-rent the place, or for encouraging people to let their renters experiment with the yard. It will stay and spread. Luckily this Galvezia speciosa (left) is ok with growing over, through and around it. The hell strip, once a massive lump of weeds, still has some weeds popping through from time to time, but mostly has CA fuchsia, yarrow, native strawberry and festuca californica established. And the craziest native honeysuckle I've ever seen. I've trained it up our street sweeping sign post. 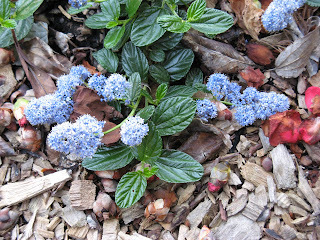 We knew this day would come sooner or later, so we chose low-maintenance, drought-tolerant species for the most part. All in all I'm really going to miss the front garden. But it was a great learning experience and as long as nobody takes loppers and hedgers to it, I think it will become even more beautiful with time.